Severed Ties is a horror comedy by Fangoria Films. It’s one part Re-Animator, two parts Basket Case with a dash of film noir and the motherly love of Augusta Gein. Boy trapped in lab by mom. Boy grows mutant, evil arm. Sound like your thing? Probably not, but this little film isn’t as bad as it may seem. Garrett Morris makes an apperance again (he has a supporting role in Fangoria’s other movie, Children of the Night) reprising his role as the homeless man…? But Severed Ties managed to pull even bigger names with Oliver Reed and Elke Sommer. Like all of Fangoria’s movies, this 1992 film was mostly shot in Wisconsin. 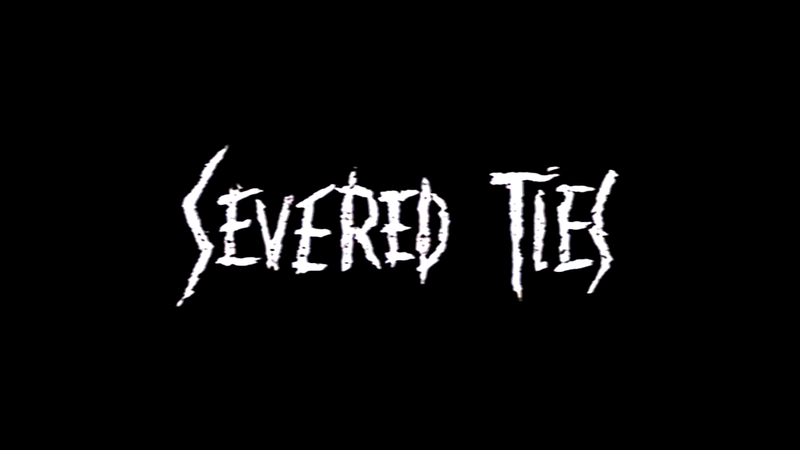 It’s not the strongest of those made by Fangoria, but Severed Ties still delivers a strange and sometimes funny film. Young scientist Harrison Harrison is being monitored in the lab by his mother, Helena, and her Oliver Reed, err… Doctor Hans Vaughan. He’s researching regeneration and trying to create a serum, a task his father had before him. His father believe in allowing his serum to be available to everyone. His son agrees. But unfortunately, mommie dearest is more interest in turning a profit from the product. The news is broken to him when Doctor Vaughan takes the serum from him. But things get considerably worse when his arm is ripped off. Like any real trooper, though, he runs out of the house and injects the serum to grow his arm back. Not just any arm, though, a reptilian one like the poor creatures he was working on. It eventually takes on a more human appearance, but it definitely grew a mind of its own. Harrison realises that the arm is part him, part reptile and part serial killer (the corpse the scientist was working on). Garrett Morris’ character “Stripes” appears and takes Harrison’s plasmid. He lost his leg during some war and he determined to grow it back. But he takes Harrison under his wing and introduces him to local crazy, Preach, who must have been excellent inspiration for Andy Serkis’s Gollum. Preach takes it pretty personally when Harrison’s uncontrolled hand slaps him. Harrison runs away but is quickly chased down by Preach. The arm is ripped off, but remains animated. It proceeds to rip Preach’s face off. The rest of the homeless community seems to find this as good news, at least. Harrison is then attacked by his arm (somewhere some pun about “don’t bite the hand that feeds you” has to fit in here somewhere) until the two come to a mutual understanding. Meanwhile, there’s trouble in paradise for Doctor Vaughan and Helena. The good doctor can’t replicate the product Harrison made. The arm is caught stealing products for Harrison, which then spurs on a sort of an “arms race” between the two parties of good and evil. In one really excellent scene, an trial of Harrison’s serum goes wrong and gives Stripes a demon leg with teeth. Though the new serum does end up working. Harrison and his crew have a short-lived success party when they are overheard by the police, leading Doctor Vaughan and Helena straight to them. Harrison’s new girlfriend is kidnapped to have tests run on her. 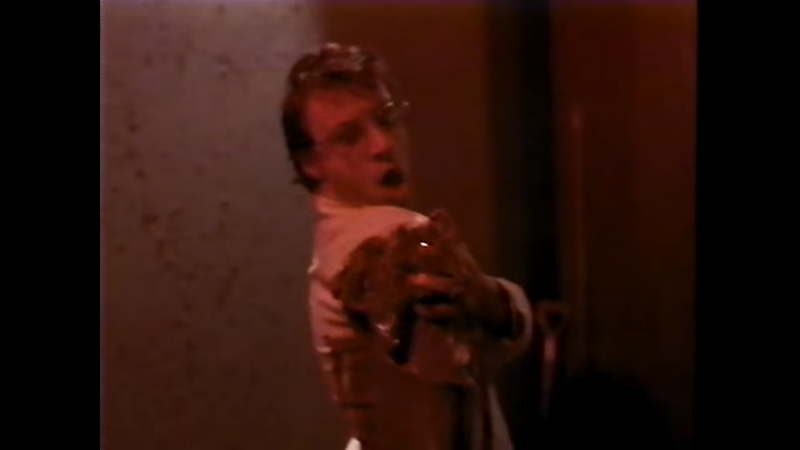 Things get only worse for the poor scientist as his arm of mutant hands ends up killing all of his news friends. But Stripes survives and rallies the scientist into carrying on with his work. But the ending is simultaneously hilarious and grim. It’s nothing you couldn’t have called from the beginning, but at least there are plenty of deaths and gore. I never thought I would say this, but I actually enjoyed Children of the Night more. But still, Severed Ties has its strengths. It can be funny and it is pretty wacky. It’s just not any better than the films it was inspired by. There are at least some fun performances by the main cast. But the real star of the movie has to be the practical effects, which are actually pretty good for a film of this caliber. This is a film probably worth watching if you really feel like murderous reptilian arms are your thing.